Liberty Elementary School was honored this week as one of 342 schools across the United States to be designated as a National Blue Ribbon School. Liberty was chosen as a National Blue Ribbon School in the Exemplary High Performing schools category. As a 2017 Exemplary High Performing School, Liberty joins just 22 other such Blue Ribbon Schools in California. This is the second National Blue Ribbon School Award that Liberty has received in the past decade. 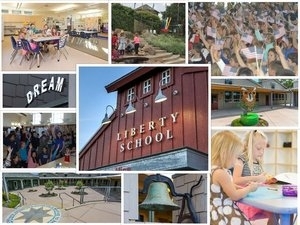 Liberty Elementary, located in rural Petaluma, serves 219 students grades Kindergarten to 6. The close-knit elementary school prides itself on a high level of parent involvement, a strong sense of community, and a focus on the whole child—all of which helps each child reach his or her potential. “Exemplary High Performing” Blue Ribbon schools have their state’s highest high school graduation rates and the highest achieving students (the top 15 percent) in English and math, as measured by state assessments. The National Blue Ribbon Schools Program award recognizes public and private elementary, middle, and high schools where students either achieve very high learning standards or are making notable improvements in closing the achievement gap. Since 1982, the U. S. Department of Education has sought out and celebrated great American schools. The National Blue Ribbon School award affirms the hard work of students, educators, families, and communities in creating safe and welcoming schools where students master challenging content.